Telemark Open Sunday, April 1st – Not Joking! Telemark said if you keep coming we will stay open. Saturday saw many people skiing and snowshoeing on our trails. For our club members we will be grooming, and open from 9-3PM on Sunday, April 1. There is lots of snow, sunshine and fresh air. Trail passes and rental equipment will be available all day. That time has come again. Even with record snow levels, the last weekend for skiing and snowshoeing at the club is here. Trail passes and, ski and snowshoe rentals, are available when the office is open during the hours below. Click here for the club grooming schedule until Saturday, March 31 which is the planned closing date. Thank you for a great season. The Youth Program Coaches have setup a little end of season adventure game. It is designed for you and your family and friends to participate. Maps are available in the chalet to help guide your adventure. Click here for a copy for your own. Objective: visit the stations and collect points (indicated in the circles 2, 4, 6 & 8). Collect a sticker or two from the envelop at each location. Team Telemark achieved its goal of placing in the top 10 Team Aggregate category at Ski Nationals in Thunder Bay! After a grueling week of competition, Telemark placed 8th overall and was the top team from BC. This is Telemark’ s best result ever at Ski Nationals. Congratulations to our athletes (Sally Haaheim, Jenna Sim, Clair Littlefair, Hannah Mehain, Thomas Hardy, Gareth Williams, Alex MacDonald, David Walker, Tallon Noble, Phillip-Maynard Davies, Ian Williams, Cole Turner, Tristan Lee, Grayson McKinnon, Colton Blaney, Connor Hobbs, Gregor Graham, Ian Mayer. ); our expert wax technicians (Aiden Oliphant, Chris Hamilton, Coach Adam); Jill Stamp and James Williams (for managing travel, accommodations, meals and driving the team van back to Kelowna in celebration of their 24th wedding anniversary! ); Alistair Graham for driving the van all the way to Lappe Nordic; Jeff Sim and Brent Hobbs for chauffeuring/wax tech support; and to our expert coach, Adam Elliot. 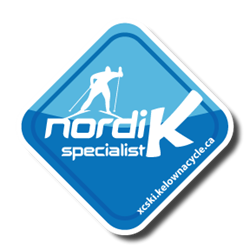 Special acknowledgment to Telemark Nordic and Kelowna Toyota for their generous financial contributions to support our athletes at Ski Nationals. Over the next week “Daughter of the Wolf” will be filming in the night, on the Telemark property. If you see a wolf it is one of fourteen wolves that are being used during filming at our club. The filming will also have handlers and actors on the property. The season ending spring banquet is coming soon. It was a successful season, and there is plenty of good news. We are looking forward to thanking this season’s 170 volunteers, and 20 staff members, for pulling in the same direction. If you volunteered during the 2017-2019 season please contact your department head, or event manager for an invitation to the banquet. Tickets are available at the door, We look forward to seeing your there. Thank-you! There will be a biathlon demonstration day and public race at the Telemark Biathlon Range this Sunday. Everyone welcome! It’s a great way to try out this exciting Olympic sport. Bring yourself, your friends, family – it will be a lot of fun! For details, please click here. Tonight will be the last night that the office will be open for night skiing. The lights will be left on until further notice and the washrooms will be open. Rental equipment will not be available in the evenings after tonight.